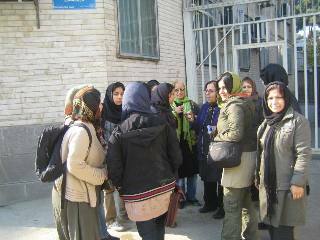 Scores of Iranian women's rights activists have once again descended on the offices of the justice department, calling on the judiciary to respond to the demands of jailed lawyer Nasrin Sotoudeh, who has been on a hunger strike since October 17. 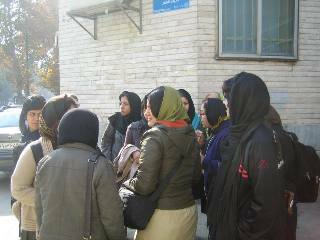 The Change for Equality website reports that the activists visited Tehran's Deputy Prosecutor on Sunday December 2 and also met with the deputy head of prisons today to express their concern over Sotoudeh's health and to demand that she be transferred to hospital. One of the activists has reported that the deputy of prisons told them that only Reza Khandan, Sotoudeh's husband, can demand that she be transferred to hospital. The deputy head of prisons has also refused to receive the activists' petition in support of the jailed lawyer, maintaining that the prison infirmary is more than adequate for attending to her needs. Reza Khandan has reported in a Facebook entry that his wife has reached a critical stage and is already experiencing "dizziness, visual impairment, loss of balance and low blood pressure." Sotoudeh is refusing food to protest the violation of her rights as a prisoner and the pressures inflicted on her family. She has said she is now willing to break her strike if the authorities lift the travel ban that keeps her daughter in Iran. 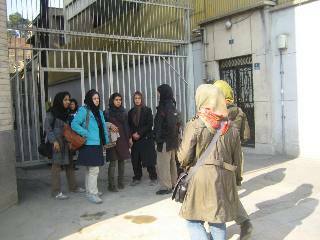 The Iranian women's rights activists are demanding immediate action regarding Sotoudeh's situation and have reported that they will continue knocking on the doors of the judiciary until the authorities take effective action in her case. Sotoudeh, a prominent human rights lawyer, has been jailed for her work with the Defenders of Human Rights Centre in Iran, which the government deems to be acting against national security.